Please strive for a professionally prepared manuscript of high technical and scientific quality. Many reviewers are overwhelmed with review requests. Our experience is that they are more likely to agree to review a well prepared manuscript. (1) Title page, (2) Abstract and Key words, (3) Introduction, (4) Materials and Methods, (5) Results & Discussion, (6) Conclusion, (7) Acknowledgement (8) References, (9) Tables and (10) Figures. Title page:It should contain, name of author(s) and an(*) asterisk placed after the name of the corresponding author, address (es) of the institution(s) at which the work was performed, each author's affiliation and a footnote including the complete mailing address, telephone number, e-mail address for the corresponding author. Results and Discussion: Results should be described as concisely as possible in one of the following ways: text, table(s), or figure(s). Avoid extensive use of graphs to present data that might be more concisely or more comprehensively presented in the figures or tables. The reproducibility and statistical significance of measurements, material or biological data, must be included where relevant. The discussion should provide an interpretation of the results and their significance with regard to previously published work. There should not be any significant repetition of the experimental procedures or reiteration of the introduction. Conclusion: A short, paragraph summarizing the most important findings of the research is required. Please make sure that artwork files are in an acceptable format (TIFF, EPS or MS Office files) and with the correct resolution. For color reproduction in print, you will receive information regarding the costs from JABE after receipt of your accepted article. Please indicate your preference for color in print or on the Web only. References should be numbered and listed on a separate sheet. Indicate references by number(s) in square brackets in line with the text. The actual authors can be referred to, but the reference number(s) must always be given. Example: "... as demonstrated [3,6]. Barnaby and Jones  obtained a different result." Kishore M, Janardhan Medikondu, Bhaskar MV, et al. The art of writing a scientific article. Int.J.Appl Phy.Nano Sci., 2013, 1:12-15. Strunk Jr W, White EB. The Elements of Style. third ed., Macmillan, New York, 1979. Mettam GR, Adams LB. How to prepare an electronic version of your article. in: Jones BS, Smith RZ. (Eds. ), Introduction to the Electronic Age, E-Publishing Inc., New York, 1999, pp281-304. Review Articles:Review articles should be about 15 pages and contain up-to-date information providing comprehensive coverage of relevant literature. Review articles should preferably be written by scientists who have in-depth knowledge of the topic. All format requirements are similar to those applicable to Research papers. Review Articles need not be divided into sections such as Materials and methods, and Results and discussion, but should definitely have an Abstract and Introduction. 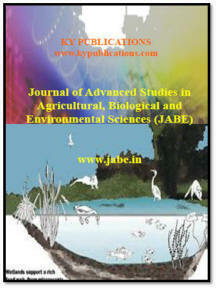 Full Length Research Papers: These papers should describe in detail original and important stages of work in the fields covered by the JABE. Short Communications: These should describe complete and original research work whose length and/or importance do not justify a full-length paper. The format Is the same as that for a full-length Research Paper. The approximate length should be 10 pages of 1.5-spaced type-script, including Tables and Figures, Keywords are essential. - Make copies (print or electronic) of the article for your own personal use, including for your own classroom teaching use. - Make copies and distribute such copies (including through e-mail) of the article to research colleagues, for the personal use by such colleagues (but not commercially or systematically, e.g. via an e-mail list or list server). - Post a pre-print version of the article on Internet websites including pre-print servers, and to retain indefinitely such version on such servers or sites. - Post a revised personal version of the final text of the article (to reflect changes made in the peer review and editing process) on your personal or institutional website or server, with a link to the journal homepage (on http://www.jabe.in). - Present the article at a meeting or conference and to distribute copies of the article to the delegates attending such a meeting. - For your employer, if the article is a 'work for hire', made within the scope of your employment, your employer may use all or part of the information in the article for other intra-company use (e.g. training). - Retain patent and trademark rights and rights to any processes or procedure described in the article. - Include the article in full or in part in a thesis or dissertation (provided that this is not to be published commercially). - Use the article or any part thereof in a printed compilation of your works, such as collected writings or lecture notes (subsequent to publication of your article in the journal).